It would be nice to buy a home entirely with cash. The transaction would be simple, and there’s only one dotted line to sign. Unfortunately, for many in California, this just isn’t feasible … at least, not any time soon. We debated waiting to buy a home until we can pay for it in cash (mostly because of the fact that I get sweaty palms every time I think about loans) but the trade-off was too great. Waiting to buy a home for cash would have taken us more than fifteen years, since we had to focus on paying down $500,000 student loans as well, which is equivalent in price to our most recent home purchase. That would be fifteen years of paying for monthly rent, which could be equivalent to fifteen years of paying down the mortgage. I ended up wiping the sweaty palms on my jeans, taking a deep breath, and choosing the latter. Meaning, I had to take on a new loan, at the exact same price as my student debt. *Deep breath* If it wasn’t for my husband, I am not sure I could cope with the thought. Reassuring hugs and “we-got-this” fist bumps go a long way. While I can ignore the nervous sweat and the anxious breathing, there is one thing a buyer applying for a mortgage cannot ignore: their credit score. Credit scores can be supplied by different companies, the most commonly used being FICO, which stands for Fair Isaac Corporation. Each score is calculated by an elusive mathematical equation that evaluates many types of information with the patterns in hundreds of thousands of past credit reports. Simply put, they are trying to evaluate the risk that comes with loaning you money. Property Ownership: How much is it worth? There are several categories that the FICO score considers, including your payment history, the amount you currently owe, the length of your credit history, any new credits you acquired, the types of credit in use, and the number of credit queries. Here are a few things to note, and then we will go in dept into each category. A FICO score requires that at least one account has been open for six months of more, and at least one account has been updated in the last six months. Although a score can quickly be lowered, it takes time to improve your score. If you are planning to buy a home, and your score is lower than 750, I would recommend starting to improve your credit score NOW. There is no quick fix to improving credit. In fact, quick-fix attempts may backfire. The best thing you can do is to manage your credit responsibly over a long period of time. A score considers all categories mentioned above, not just one. Everyone’s score is calculated a little differently. One category may have more emphasis when determining my score whereas another category may weigh more heavily in calculating someone else’s. It’s impossible to say how important each category is, because it differs from person to person, depending on the overall picture. Therefore, it is important to work on each of the categories. With that being said, the general rule for a majority of people is that the categories are listed in the order of importance, with the payment history usually being the most important and the number of new queries being least important. With that, let’s get right into it! Payment history on many types of accounts, including credit cards, installment loans, and finance-company accounts. Public record and collection items, including bankruptcies, suits, wage attachments, liens, and judgements. Bankruptcies stay on your credit report for 7-10 years. A foreclosure, short sale, or deed in lieu of a foreclosure lower your score by about the same amount. These are considered serious delinquencies, so don’t expect to get a new mortgage loan with favorable terms for 5-7 years. Details on late payments: Your score considers how late payments were, how much was owed, how recently they occurred and how many there are. For example, a 60 day late payment is not as damaging as a 90 day late payment. However, a 60 day late payment made one month ago affects your score more than a 90 day late payment made five years ago. How many accounts show no late payments, which will help increase your credit score. If you’ve missed payment, get current and stay current. If you are having a difficult time making ends meet, get help. May I suggest a financial planner? The amount owed on all accounts and on different types of accounts. The total balance on your last statement is generally the amount that is shown on the report. The score will also consider what types of accounts are being used. How many accounts have balances. A large number can indicate overextension. How much of the total credit line is revolving credit, meaning carrying a debt balance month to month. Those who are closer to maxing out on many credit cards may hold greater risk. How much of the installment loan accounts is still owed compared with the original amount. Car payments are a great example. Even if you’ve been paying the monthly dues on a $10k car loan, if the majority has been going to interest, then you may still owe 80% of the car loan when you apply for a mortgage. Paying down installment loans at a quicker rate obviously looks good. Keep balances low on all credit cards. Pay off debt as close to 100% as you can. Don’t close unused credit cards as a short-term strategy to raise your score. It won’t work, and it may even lower your score! Long established accounts show that you have a long history, which is good in the eyes of a lender. Don’t open new credit card accounts that you don’t need. I am talking to you travel hackers out there. Put it on pause. How long credit accounts have been established – the longer “the better”. Also, the more diverse types of credits you’ve been managing, the more responsible you seem. How long it’s been since you used certain revolving credit. For example, an inactive credit-card is given less weight in your credit score than active ones. Don’t open a lot of new credit cards. Remember that new accounts will lower your credit score, even if it is temporarily. How many accounts you have. It will especially look at how many of those accounts are new. How long it has been since the most recent account was opened. How many requests have been submitted for credits. Typically, inquiries remain on your credit report for two years, although FICO only considers inquiries from the last year. The length of time since lenders made credit report inquiries. FICO will ignore inquiries that are more than a year old. Whether your recent credit history is good following past payment problems. Off course, your score will be improved after getting current and staying current. When you search for multiple loans, do them all within a certain time period. The different types of credit accounts you have. They look to see if you have a mix of credit cards, retail accounts, installment loans, finance company accounts and mortgage loans. Off course, this does not mean you should go out and get one of each! How to improve your score. You can open new credit cards but ONLY AS NEEDED. You don’t need one of every type. Plus you have to remember to manage them responsibly. Meaning, pay each credit card in full at the end of the month. Note that closing credit accounts does not erase them from your report. Inquiries do not have a large effect on your score. Typically, this lowers the score by less than five points. That being said, there is a larger impact if you have a short credit history or if you have few accounts. Also, people with six inquiries or more on their credit reports are 8 times more likely to declare bankruptcy, something worth considering. Many inquiries are not counted at all. The following are not counted, although they may appear on your credit report: orders made by you from a credit reporting agency, lender requests for your score in order to make you a pre-approved credit offer, and requests from employers. The score looks for rate shopping. This is why I mentioned before that shopping around for a mortgage or an autoloan should be done at the same time. Multiple potential lenders may pull your credit report, even though you are only looking for one loan. The score counts multiple inquiries in a 45-day period as one single inquiry. Also, the score ignores all inquiries made in the 30 days prior to the scoring. So there you have it! Trying to understand your credit score can be overwhelming. Score determination is muddled by the fact that each individual’s scores bear different weights for different categories. The most important thing to remember is that you want to prove that you have little risk for defaulting on a loan. So pay back debt, stay current, be responsible, and do this over the course of a long time period. And the best day to start is today. Today, I wanted to pose the question, “Is having a CFP right for you?” When I first graduated from dental school, I was absolutely lost. Along with the feelings of excitement and pride with my recent accomplishments came a subtle (but over-powering) dread, and a very heavy, invisible weight. I knew I needed guidance, but did not know who to reach out to. I did not exactly have adults in my life who could act as good financial role models (my long historical relationship with money detailed here), and there are very few people I know (outside of my fellow graduates) who really had the problem of paying down half a million dollars in student debt at 26 years old. So I reached out to Andrew Davis, the CFP behind SeamlessFP, who happened to be the husband of a dental classmate, and whose work focused on guiding newly-graduated dental students, specifically. I think it was the best decision we ever made. On the flip side, there are people who would argue that CFPs are a waste of money, and that money could be used elsewhere. Which is a fair argument. I myself am a big fan of avoiding outsourcing tasks as much as possible. It will take a bit of work, but handling your own finances is totally a doable thing! However, it requires time, which I have value over money. Delving into research isn’t such a scary thought for me, but spending all my free time learning the nuances of taxes, S corporations, estate planning, investments, and more is NOT an enticing thought. So what I want to discuss today is the value of having a CFP to us, and then I leave the decisions to you. The list of pros for having a CFP versus not having one is quite long, which is a good thing! Pro: Outsource financial planning to free up time, in order to pursue interests, hobbies, work, etc. As mentioned before, outsourcing financial planning frees up a lot of our time. Time is a resource scarcer than money in the modern world. People seem to always be running out of it, but are still quick to occupy it with tasks, necessary or otherwise. When you think about how much your time is worth, in dollars, can you really put a price to it? Time is the one thing you are constantly running out of, and will never be able to replenish, making it an extremely valuable resource. Being intentional with the tasks I choose to occupy my time is very important to me. Spiritual uplifting, emotional replenishing, mental healing, these are the things that matter and make it a life worth living. NOT constantly worrying, thinking, and dealing with money. Pro: Peace of mind that we are hitting our financial goals in a very step-by-step (and legal) manner. This is for the DIYers out there. I am a lover of DIY projects and take pride in my ability to be self-sufficient. However, no matter how much of my free time I put into studying the nuances of finances, I cannot possibly keep up to date with the ever-changing rules and regulations. Mike used to do his own taxes with TurboTax and that worked sufficiently well, but once we got married, added in an S-Corporation with its own separate payrolls, well things got too complicated. We started asking ourselves, “How do we know we are following all the rules? How do we know about the fine-print clauses that benefit us? Who will be flagging our attention with every change?” A financial planner gives us peace of mind, knowing that we are on track to hit our goals in a efficient (and legal) manner. There are many minute details that one could miss, but it makes us feel better knowing that we have someone else helping us with that. Pro: Keep up to date with new changes. The new Tax Bill that passed last year is a great example of this. Even now, nothing is quite set in stone as to how these changes will apply to us. By having a financial planner, we were alerted to the possible beneficial change for S Corporations in the upcoming year, something we would never have known, but definitely can impact our financial plan. Pro: A resource for learning more. This, by far, is the most beneficial to me. Andrew has been instrumental in educating us about our finances and different paths we can take to achieve financial freedom. He has recommended books, blogs, podcasts, and other resources. He was actually the one who introduced us to the FI community: a community dedicated to reaching financial independence by using life optimization “hacks”. We would not have gone so far on our financial road to freedom without life hacks such as co-housing, travel hacking, YNAB, and more! Financial planning VS Investment Planning – What’s the difference? It is important to differentiate between financial planning and investment planning. We do financial planning, which requires a long-term life plan, created by the marriage between our financial past and our dream futures. Our first meeting with Andrew was not something we expected to have. It began with a meeting dedicated wholly to gaining a deep understanding of our personalities, goals, and dreams. It almost felt like a therapy session, with questions such as, “If you knew you were going to die tomorrow, what would you spend your time doing today?” Don’t let that deter you. I think that first meeting was essential to setting the foundation on which we created our entire plan. The process continues to be a constant reassessment of life. Initially, we listed our priorities as traveling, buying a house, yoga subscriptions, guitar lessons, sticking with loan repayment program, and working until we were 65 years old. Now our life still includes travel, but our goals have shifted to standard repayment, renting for the next few years, working less hours, being a blogger, opening a coffee shop, and early retirement from our lines of work, which would possibly lead us to newer lines of work. In this respect, Andrew acts as more than just a financial planner. He is a psychologist, therapist, educator, mediator between spouses, confidant, & friend. This is NOT to be confused with investment planning, where someone advises you where to invest your money. That is included with financial planning, but not the other way around. A fiduciary requires that someone acts in the best interests of a client. It is important that your CFP is a fiduciary in all aspects. Conflicts arise when CFPs have affiliations with third parties that may sway their advice towards promoting something that benefits them. For example, a person can receive a profit for selling an affiliate insurance. The insurance may be great, however, that person has a motivating factor that would make him want to promote that particular insurance. Even though it can be beneficial for you to sign up with that insurance company, the decision was not completely unbiased. We did not even realize the importance of being a fiduciary until we learned the concept from Andrew himself. If you are not sure whether your CFP is a fiduciary, ask! Try to find a fiduciary in all aspects. You want to ensure that you are being treated fairly at all times. Do not be afraid to ask how they get compensated, so that you can truly see where they are getting their money. It may seem awkward to inquire about it, but it is your finances on the line. Budgeting Help: Our CFP introduced us to budgeting, setting up our YNAB budgeting tool, and helped us develop good budgeting habits. Analysis between two potential jobs: When Mike was considering making the move from one company to another, we needed help analyzing whether it was a reasonable financial move. It was not simply a comparison between the two different income, but also required factoring in 401k investment matching, health benefit options, life insurances, difference in commute, and level of interest in the line of work. Investment Planning: He has given us advice on how to manage our 401k portfolios as well as given us other investment tips when we reach out for help. We retain full autonomy as to where we want to invest and how much, but having a third person to go over the pros and cons at each step has been helpful. Health Benefits: We needed help deciding on a health plan, and have chosen one that works well for us thanks to Andrew’s help. After an analysis of our options, an HSA option was also open to us, and we decided to take advantage of that privilege. Renter’s Insurance: Prior to our new place, we did not have renter’s insurance. After seeing the benefits of having that extra coverage at a small monthly cost, we decided to sign up for one right away! Connection to a CPA: Taxes for SCorps can be a bit tricky. A CPA is advised so as not to miss a thing. Initially, I was going to go with the same person my parents have used for years. But after an hour-long interview with him, it became clear to me that he did not know much about taxes as they applied to dentists specifically. He did not even know about the different student loan forgiveness programs, or how an SCorp can be used for tax deductions. It was useful to be referred to a CPA who frequently does taxes for dentists specifically. Set up my SCORP: This was so beneficial to me! It is possible to create a corporation easily online, however, he walked me through the pros and cons of having an SCORP so that I could make an informed decision as to whether this is something I wanted to do. The application for the SCORP was easy but we did meet some humps along the way that he quickly helped me to resolve. Setting up Gusto and ways to automate my SCORP: Once the SCORP was set up, our CFP took care of creating an automated payroll for me. We use Gusto to manage my payroll, and once it was set up, he easily walked me through the different ways that we can keep track of the payroll via my SCORP. All I have to do is wait for my payments, the system takes care of the rest! Introduction to financial life hacks: I learned tricks such as travel hacking from Andrew and it was he who introduced us to the FIRE and FI communities. Analysis of student loan repayment options: This is the part about our finances that has most affected our lifestyle. He walked us through the different student loan forgiveness programs that we qualified for. After a thorough explanation of each, he created an extrapolation of our financial futures under each repayment option. By using physical numbers, we were able to predict the lifestyle changes associated with each student loan option. Once we had our budgeting in order, he brought to our attention that we were able to pay down student loans without the forgiveness program, thus saving us more than $100,000 in the long run, as well as buying our freedom 15 years earlier than planned. That decision itself was so life-altering for the better, and we would have never gotten to that point on our own. Andrew Davis is the CFP behind SeamlessFP. He focuses on helping newly graduated dentists create a financial plan. He does work with non-dentists occasionally, or dentists who have been practicing for a long time. I only know this because we have referred people in those categories who now are working with him too. There are multiple options one can choose when working with SeamlessFP. A person can do a one-time consultation in order to gain help on a particular goal or project, or they can choose the full life-planning package. We chose to do the latter option. I did not want help with simply setting up an SCORP. I wanted a more thorough analysis of all of our financial details. I was determined to tackle as many aspects as possible to optimize our financial situation. After every meeting, he will upload a list of tasks via an online portal to be completed. This is helpful for people who need someone to hold them accountable to ensure that they continue moving forward with their financial path. Together, we re-analyze continually to see what we can change to optimize even further. A yearly re-cap meeting is held as well, where we go over our dreams and goals for the future (5, 10, 25 years out) so that we aren’t dully following a pre-set path. Besides, a lot changes in a year! What I like most is that he is eager to help clients learn more about their financial options and situations. It is clear that having his clients make their own decisions (given the facts) is important to him. I can ask him one question, and we will go over the entire topic in detail, prior to him answering my question just so that I know the reasoning behind his answer. It’s scarce to find that these days, and I wholly appreciate it.He may give suggestions but he really makes sure you know that ultimately, the choices are still completely yours to make. It’s easy to see that his goal is to help his clients find the happiness they seek, by eliminating financial stress from the equation. It also helps that he is very accessible via email or text. Typically, responses occur within one day. Additionally, if you choose the latter option, there is unlimited access. Anyone who knows me will easily tell you that I am the type to ask multiple questions, always in search of a deeper understanding of all things. So a CFP who embraces that is gold. Off course, you want to make sure that the CFP you choose is right for you, if it’s right at all. If you have any interest in learning more about our friend Andrew, you can easily set up a one-hour phone call to speak with him and see what services he can offer you and which package is best for what you are trying to achieve. Overall, I just wanted to shed light on how a CFP has changed our life in this blog post. As always, you do you. Right on the heels of my previous post is a suggestion for all current college students to avoid taking out the maximum student loans in order to travel the world. Lest anyone got the wrong idea, I think a follow up is necessary to shed light on the fact that I used borrowed money to pay for my portion of that trip to the Bahamas. More blatantly, I made a mistake, and learned from it, albeit a little too late. By no means do I regret travelling, ever. There’s a lot to glean from expanding horizons and investing in your world view. You learn things about other people and other places, as much as your own home and yourself, that you will never learn in a classroom. And I paid an arm and a leg for a classroom. So it’s worth paying to travel. But it’s NOT worth spending borrowed money, which equates to borrowed time. In your early twenties, it seems like a wonderful idea and the repercussions are not so easily visible. For the first time, you have the ability to have access to “extra” money, and the calling to reward yourself during seasonal breaks is all too strong to resist, but resist you must. I was advised to take out my maximum student loans from the get go. You know, just in case. As in, just in case I find something else to spend that money on. Which, for a young twenty-something, isn’t entirely too difficult to do. I was told that once I was a dentist, I would have no problem paying it back. The premise was that I would be making so much money that it would be easy to get rid of that debt quite quickly. So worry about it later. What appeared odd to me was that when I got close to graduating, I kept being fed this “worry about it later” mantra. I was told I could (and should) put loans on the back burner for another twenty five years under a loan forgiveness program. Because by then, I’d be like, a millionaire or something, and it’d be suuuper easy to pay it back, surely. Which is the same reasoning they fed me when I started dental school. It was then that I woke up, and realized that all people are saying are “worry about it later.” I started worrying about it NOW and when I did, I realized that I was sold a lie. Unfortunately, the realization hit me a bit too late. Towards the end of dental school, I had accumulated “extra” money, read as extra loan money. We took that trip to the Bahamas, and I wanted to pay my share for the trip. You know, with my “extra” money. I’d call myself a downright fool for ever thinking that borrowed money is money worth spending. Especially on frivolities such as trips. As a young twenty-something, I still did not have a full grip on the daunting largeness of my student loans. What difference does a few extra thousand make? Well, glad you asked (because I surely did not)! Warning: The example below is not as hypothetical as it seems. 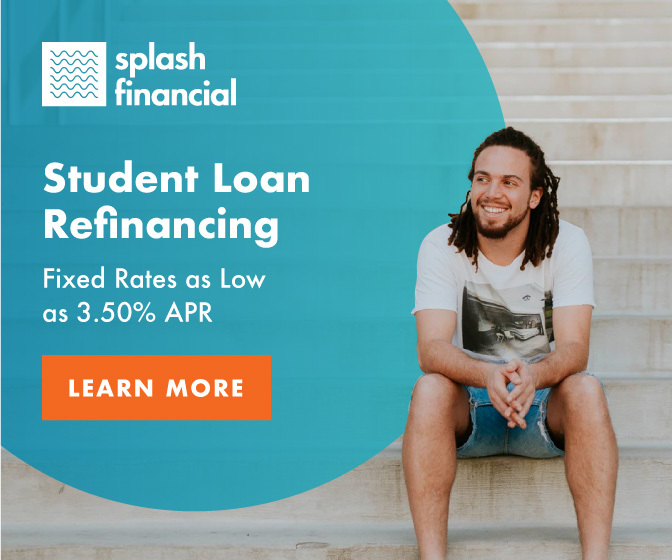 Assuming you take a $550,000 loan out, but towards the end of your schooling, you had an extra $5,000 left. You decide to take an international trip and reward yourself for all your hard work. So instead of using that extra $5000 to decrease your loan to $545,000, you keep your loan at the maximum $550,000. If you decide to do a 10 year standard repayment plan such as I did, the difference after ten years is about $7,000. Which means that instead of a $5,000 trip, it was actually a $7,000 trip. That’s a 40% increase from what you thought the trip originally cost, assuming no inflation occurs in ten years (unlikely). For those unconvinced, they ask, what does a difference of $7,000 make in a loan so large? The literal answer is slightly over a month of loan repayment. But the non-visible answer is hundreds of patients, hours of static postures, tens of times recharging your loupe lights, and more than a few times that your back aches, your eyes become strained, your fingers cramp, and you come across a stressful situation. It’s a month of your life spent earning an income and getting nothing out of it. Well, except a trip that you took in your twenties. So the real question is, how much do you value a month of your life? The answer depends on what camp you fall under: YOLO or JOMO. If you fall under YOLO, then yes, maybe the trade off isn’t so bad. If you fall under JOMO, then the outcome isn’t so good. For the record, I did not regret that trip. I just regret the resources I used to get there. But hey, at least it wasn’t an engagement ring! For those interested in traveling while in school, might you try travel hacking instead?